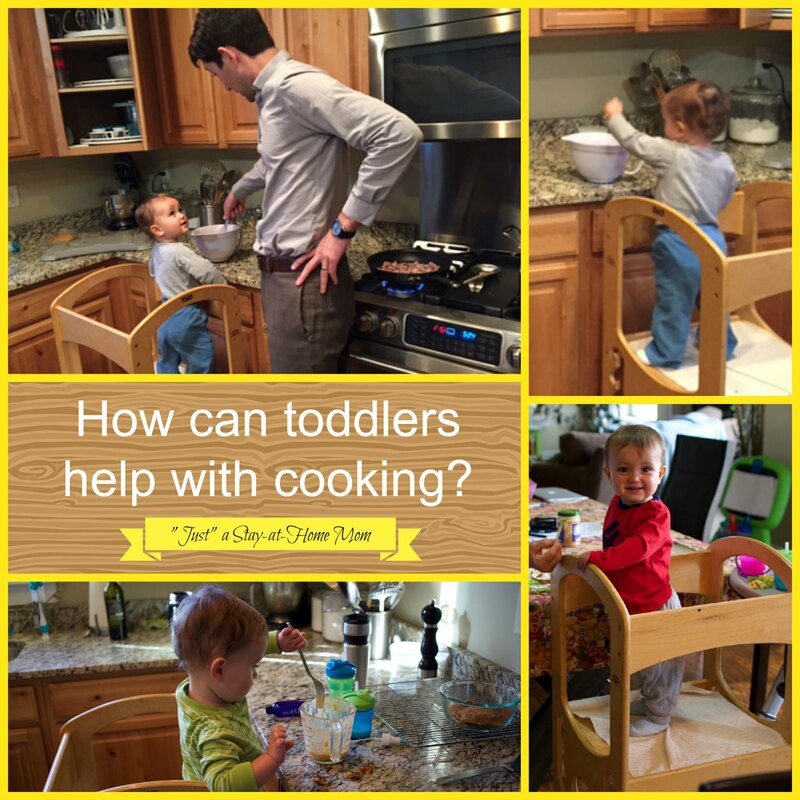 If your 1-year-old is like mine, they LOVE to be involved with cooking (or anything you are doing in the kitchen)! My Chunky Monkey loves to sweep too. These are aspects that Montessori calls “Practical Life” lessons. When a child has ways that they can be involved in the daily activities (cooking and cleaning), they develop independence and confidence. 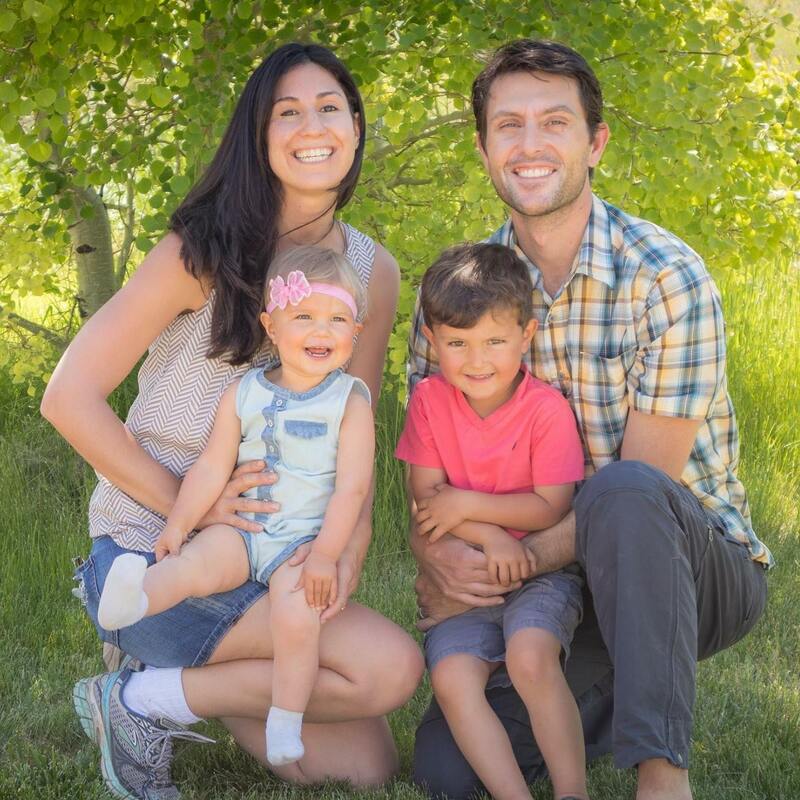 Here’s how they do practical life lessons in a Montessori school. Here are some ways we have found we can get our 1-year old safely involved in the kitchen. 1. Purchase a learning tower. They are a bit pricey, but you will use it for years. Also, to us it is worth a million dollars for how happy it makes our son as he is able to more easily help out in the kitchen. You can set it anywhere and adjust the height so your child is easily (and safely) able to reach the table or counter. 2. Get out the salad spinner! Our son has loved “helping” make salad since he was 10 months old. He pushes the button for the salad (which helps him build important hand muscles that will be needed for writing and drawing), and he takes the lid off on his own. He also loves to tear the lettuce into small pieces and put them in a bowl I set next to him. The trick is to have his hands washed and a very clean floor under his work area. 🙂 That way if/when he drops pieces, they can easily be picked up and used. 3. Look for opportunities for them to help stir. 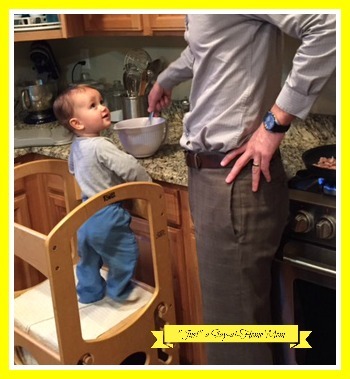 Our Chunky Monkey loves to help stir, and it’s an activity that enhances his arm coordination. We stand close-by, but encourage him to be as independent as possible. His smile is usually about the size of a slice of watermelon, as he feels so proud to be helping. *As a side note: I believe in the Positive Discipline principle that children thrive when they have a sense of significance and belonging. Learn why we need a sense of belonging here. I’d love to hear other ways you get little hands involved in the kitchen. Please share below. I love getting kids involved in the kitchen. 🙂 Pinned! Maybe I should listen to my husband….